CUSTOMERS ARE SEARCHING FOR YOUR BUSINESS! More and more customers are using the internet, especially on their mobile phone to shop locally. NOT SURPRISING! The BIG question for Small Business Owners; can they find YOUR BUSINESS on page one of their search inquires? 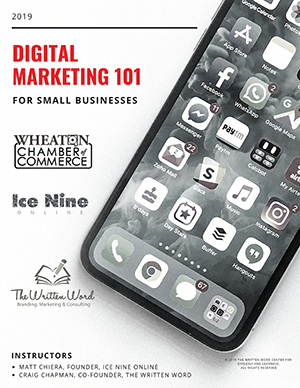 These classes will teach you a few simple, impactful tactics that improve your business's digital footprint and help attract new customers while retaining current customers. March - Website SEO and Google My Business: How to make your web site and business listing more relevant for customers searching online. June - Social Media and Content Development: Develop a strong social media presence to improve your businesses’ search ranking and customer engagement. Find out who is visiting your website and using this information to grow your business.